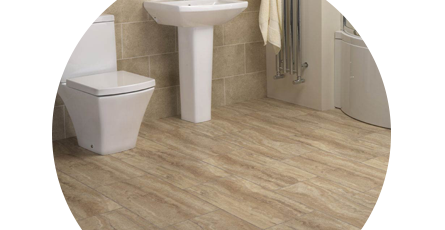 Bathroom vinyl flooring is a popular choice due to its stylish look and low maintenance. Vinyl flooring for bathrooms is strong, durable and waterproof which makes it perfect for floors in your bathroom, en suite or cloakroom. With vinyl tiles you can achieve a cost effective solution to beautiful flooring in your bathroom. Bathroom vinyl flooring is comfortable with its cushioned underfloor and comes in a wide variety of options to suit any bathroom style. Bathroom vinyl tiles are easy to fit too. For example, Intergrip vinyl flooring by Mere offers a simplistic fitting method which means you can buy your tiles and fit them in your bathroom in next to no time at all! These fast fitting vinyl flooring tiles are strong and durable, resistant to daily bathroom usage.